Since 2002, Hop To It Towing has been the most reliable 24-hour towing service in Rutland, VT. We are a family-owned and -operated business with over 20 years of experience in towing, roadside assistance, auto recovery and vehicle salvage. As a AAA affiliate, we work hard to provide you with prompt, reliable services! Whether you’ve been involved in a wreck or you’re just sidelined with a flat tire, it pays to call an experienced towing company in Rutland, VT to assist you. When you make the call to Hop To It Towing, you can have complete peace of mind that you’re in good hands. We can tow anything, anywhere, and we make it a point to get to you promptly to deliver service. From cars and trucks, to motorcycles and ATVs, to fifth-wheel vehicles and even inanimate objects, rest assured we can rig it up and tow it away! We have powerful winch-out capabilities and flatbeds in our fleet, ensuring your vehicle is handled properly at all times. In addition to full-service, 24/7 towing in Rutland, VT, we’re also your first call for roadside assistance, Whether you’ve run out of gas, have a flat, locked yourself out of your car or are stuck off-road, we’re here to help. Our goal is to get your vehicle roadworthy again quickly, to ensure your safety and prevent other problems from arising on the side of the road. Beyond this, we can also pick up junk cars for salvage and scrap. Ask us about used auto parts and we’ll be happy to help you find what you’re looking for. We invite you to contact us today, no matter what type of towing you need, and we guarantee you’ll get a customer experience like no other. We’re on-call and available 24 hours a day, 7 days a week for your convenience. We’re a AAA-affiliated towing provider. If you would like to use AAA, please obtain an incident number prior to calling for service! Our business is family-owned and –operated, backed by more than 20 years of professional experience. We offer junk car removal and towing for inanimate objects such as logs. We can salvage vehicles and we sell used auto parts. 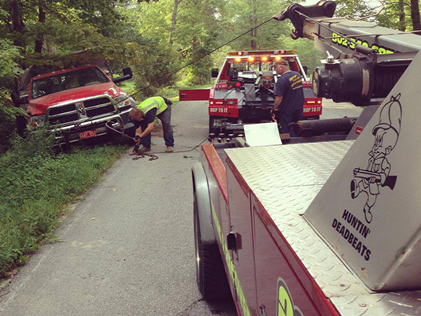 If you need prompt and reliable towing in Rutland, VT, get in touch with us today. Ask us how you can pay just $50 for in-town towing!